Welcome To Bonnes Amies! : Dreaming of Chairs?? Have a thing for chairs? I certainly do and love each one I have-even the old ancient ones stuffed with horse hair-they seem to come alive after you get them recovered it's an exciting process! We carry a wide range of fun and new upholstery fabrics. We can even help you pick and find the fabric you are searching for. Better yet design your own chair! 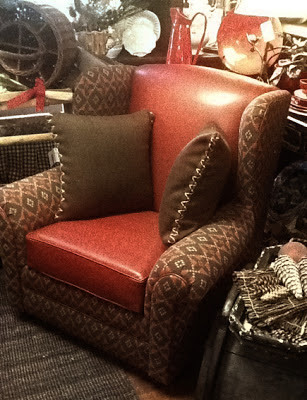 This is the cowboy style chair-custom made wingback in a chocolate brown and red kilim with red leather...What fun it is getting in new chairs for the shop come and have a seat! Yes and we make ottomans as well just as fun!